Do you ever see something and just have no idea how to react? You start to utter jumbled syllables, unsure of what you’re feeling or how to express it? Awe? Shock? Wonder? Attraction? Revulsion? Love? Panic? That’s how I felt when I saw this caterpillar. How is this possible? How is this even real? What’s with the bright colors and spots? And that ridiculously smooshed face? I know I shouldn’t be surprised by things like this, but I always am. Caterpillars have such an amazing array of coloration, defenses, postures, patterns, shapes and sizes – there is always something new to discover. This big guy is Eumorpha typhon, in the family Sphingidae. It will turn into a beautiful moth one day. 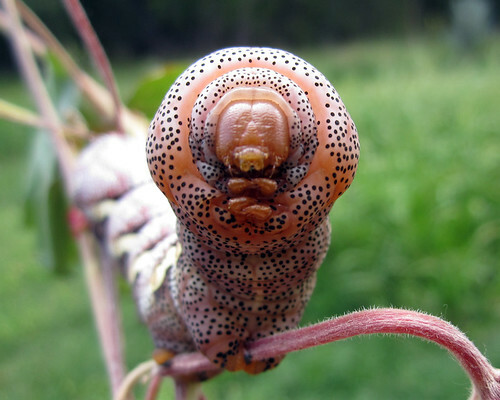 Posted on September 20, 2011, in Arizona Lep Course, Invertebrates, Lepidoptera, Sphingidae. Bookmark the permalink. 4 Comments. Every August I make a pilgrimage to the outer cape in MA to track down this guy’s two native cousins, E. achemon and E. pandorus. I’d love to see the rest of the genus, especially E. typhon and E. labruscae. Wish I could have made it to AZ this year. 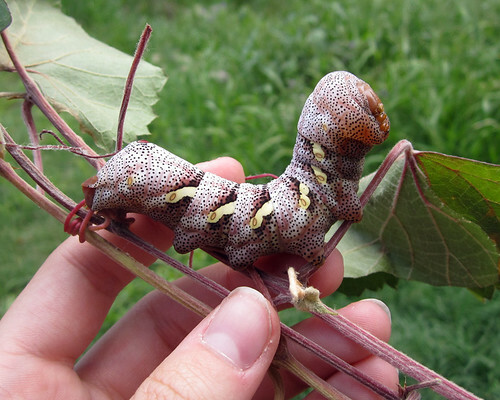 I love Eumorpha hawkmoths, but I had no chance to find someone who can send pupae of this and other american sphingidae species here where I live (South Italy). If you know anyone who can help me, just send me a message! You didn’t boil it than put it in Alcohol? What about that big pseudosphinx in your profile picture, did you boil that one?